“I swear I turned around for one second,” Logan said, panic saturating his pores. I don’t doubt this. Pearl is fast. To give you a reference point, she’s somewhere between a snake and a mongoose, and a panther. She had closed the door to our bathroom and opened the nearest drawer effectively barring anyone from getting at her. We stood staring at the door, mentally calculating the life-threatening dangers locked inside the bathroom with our daughter, united in dread. Logan used logic to determine breaking the window was our best option. I utilized a mother’s expertise for nonsense and casually suggested to my 10 month old, “Pearl, babe, close the drawer.” Voila. She closed the drawer. Multiply impossibility and subtract reason, these are the mathematics of motherhood. Today I will admit she was probably just excited to hear my voice. Years from now, as my maternal induced psychosis worsens, the story will evolve. I will proclaim my daughter followed precise instructions given to her in fourth century Latin and upon opening the door, gave us the square root of pi. Enjoy this time of partial sanity my friends, it is merely fleeting. Borderline heart failure induced panic followed by baffled laughter, a shoulder shrug, and onto the next chaos tornado, parenting defined. Ultimately it seems, with a little luck, resolutions to life’s most earth-shattering moments can sometimes be swift. Similar to my recent thyroid cancer diagnosis which had us equally flabbergasted, the solution will be simple and relatively easy. A few weeks from now I will trade my thyroid for a scar but, like our bathroom window, I will remain intact. More importantly, I will be happily exaggerating Pearl’s intellect for many, many years. The familiar squeak of the hinges and then the warm rush of a forced-air furnace, I’m instantly relaxed. A few faces turn to smile at our arrival and the lively chatter resumes. We place our coats on ancient, battered hangers and line up our shoes with the others, snow melting wet puddles into the abused carpet. The routine of this moment is so comforting. 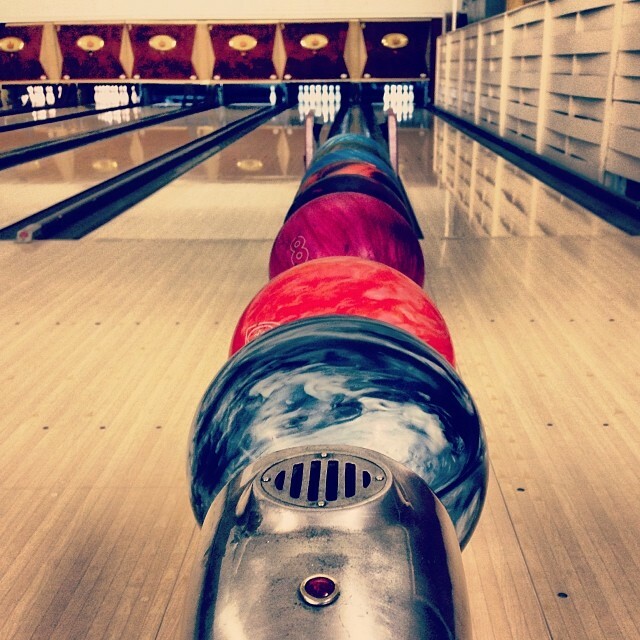 For one night each week, this run-down bowling alley is my happy place. I forget about my incessant need to tackle something more meaningful, I let go of my nagging subconscious telling me to think bigger. Thursday nights are for cracking corny jokes, for smiling wide and genuine, for contemplating new theories on alcohol to turkey ratios: this week I bowl better with my glasses and drinking only Coors Light, last week’s three cocktail minimum was a total bust. This is where my fears of impressing a small community fade, where I feel less like an outsider and more a part of the scenery in which I want so badly to blend. The radio plays state basketball playoffs and the whole place keeps one ear on the game. But it’s not all easy talk of weather and sports. Somewhere between clashing pins and stiff cocktails, the hard stuff filters through, quiet conversations with down-turned eyes; the recent loss of a beloved sister, struggling to find your place in a community you’ve called home for 30 years, worries over a son’s divorce. It’s easy to gaze on this scene and call it simple but there is nothing easy about this life.